It’s Wednesday and we are back with our latest YouTube video tutorial! Are you subscribed to our channel? If not, be sure to subscribe HERE! Today we are sharing an awesome gift idea! With Christmas just around the corner, we love finding fun and cute gift ideas that don’t break the bank. 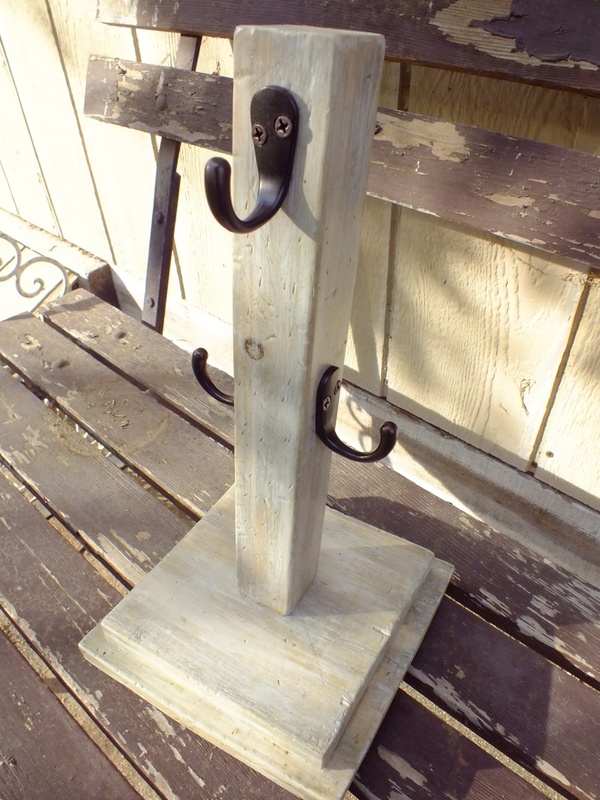 Check out our Shanty Mug Holder! How fun is that? These are SO easy to make! Be sure to check out the YouTube video first HERE or click the button below! You can download and print the FREE PLANS by clicking HERE! First, you want to make your cut. This is a great scrap pile project! Be sure to check your scraps before buying anything. All you need is about 15″ of 1×8 board and 12″ of 2×2 or a 1.5″ dowel. These are your cuts for the base which are made by trimming down 1×8 board. Your first step is attach the two small square pieces together. We used a wireless Hot Glue Gun. Next, we hot glued the dowel piece to the top and center of those pieces. To hold everything good and tight, we used a 2.5″ spax or wood screw through the bottom and into all 3 pieces. Once all of this is complete, you are ready to stain or paint yours! After it dries, it’s time for the cute stuff! I found all the knobs for the tops at Hobby Lobby. 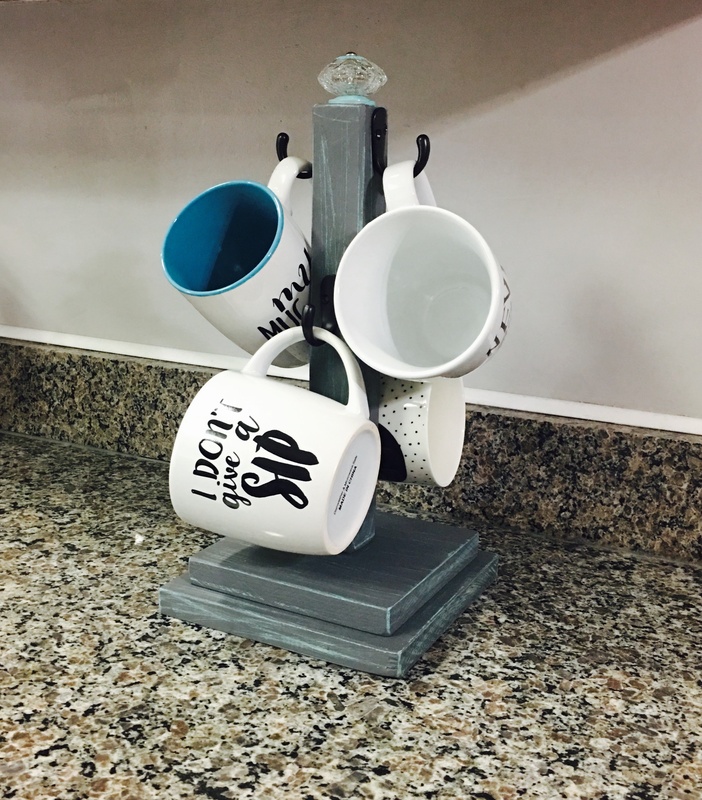 Here are a few more shots of our Mug Holders! Ok. Who else is DROOLING over that vent hood?!? Do you have a plan to share for that? Just finished a couple of https://uploads.disquscdn.com/images/54edbd13ba11e1a969b5d1961745d03d5d548d1e6f27cd81bcd868eb57ea5b12.jpg these and they turned out great! Love your guys projects! My hubby and I love your stuff. We made your magazine tray for each one of our kids this year and they loved them. 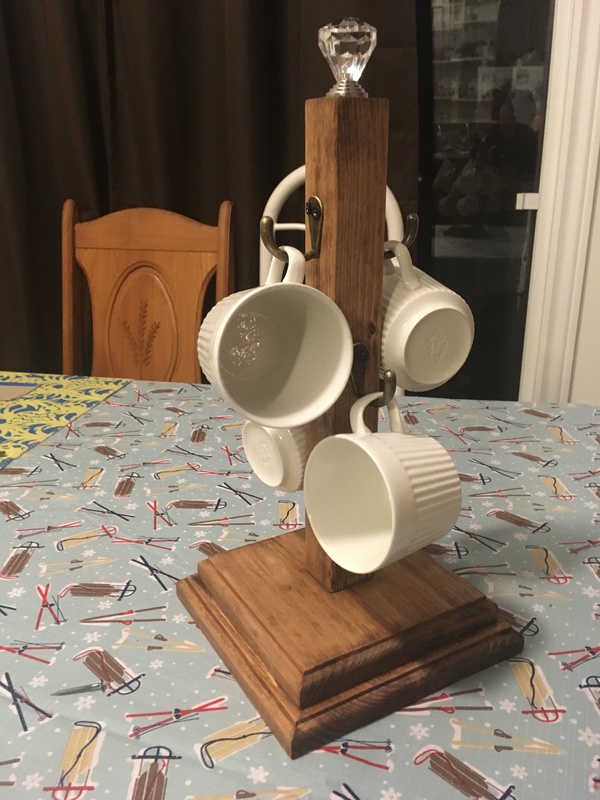 We are in the process of making this mug holder for a homemade gift exchange this weekend. We have a quick question, the knobs we found for the top all have the screw going in the opposite way as the one you had in the video. The head of the screw points down, we aren’t sure how to attach it to the top. Do you have any suggestions that might help? Are you guys planning to post plans for the hood pictured above?! I LOVE it! I’ll be making these for Christmas for family. I love them! But I’m really curious where you got that beautiful decorative piece on the wall above your stove top in the background. This is a great gift idea. Thank you shanty-2-chic.???? What are the stain colors you have used here? I’m loving the dark one! Most likely Dark Walnut. Depends on wood type being used. Pine/poplar- jacobean/ebony. And water pop/ sand prior to staining to reduce blotchiness. Oak- dark walnut or jacobean are medium dark.